In Paris, on the Quai Voltaire, amidst antique dealers of the highest order, along the left bank of the Seine, directly across the river from the famous Louvre museum, there is a shop. 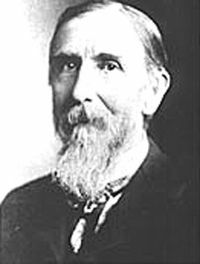 In 1887, or, perhaps, 1888, the shop was nearly bankrupt. With the sale, former shop owner M. Prevost, makes dreams come true. The new owner, Gustave Sennelier, always hoped to own a shop where he could manufacture and sell his own artist’s pigments. 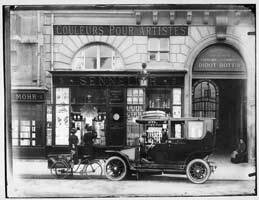 And so, the shop became known by the sign visible to all of Paris, Sennelier: Couleurs Pour Artistes. This was an especially exciting time to be selling colors and working with artists in Paris. The impressionists enjoyed their first successful group show in Paris in 1886. Painters were experimenting with color and light, trying new formulas and new ideas, and often relied upon the good advice of the chemists who were emerging as colorists. 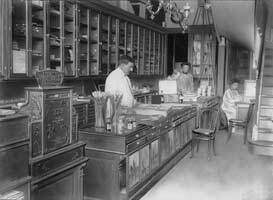 (Previously, pigments were sold in pharmacies as a sideline; art supply stores were still a relatively new idea.) As chemistry and art intertwine, artists now regarded as legend were working professionals who purchased their supplies from Sennelier. Cezanne was one of many in Paris who frequented the shop; others included Pierre Bonnard, Robert Delauney, and Pablo Picasso. Seeking new products and new opportunities, Sennelier’s pigments found popular use for batik (the pigmentation of decorative fabrics), painting on porcelain, and in new formulations for artists, including, for example, new oil pastels. “Picasso adopted it immediately. He asked for it in 48 colors of which–Picasso’s grey period required it–10 were shades of grey, a heresy in the age of colors.” Artists used the new oil pastels to start an oil painting, allowing the fluidity and ease of sketching onto the canvas. Then, the painting would be completed in a classical oil painting style. The Sennelier family has passed knowledge, chemistry, color sense and business sense from generation to generation. 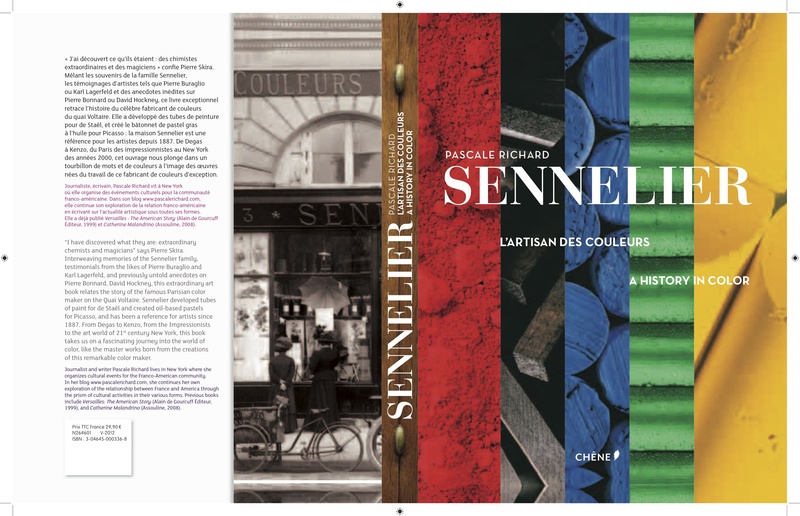 In a sense, the new book, Sennelier: A History in Color by Pascale Richard, is a family biography. As with the Parisian landscape, the family is part of a bolder story: the powerful relationship between science (chemistry) and a tremendous assortment of artistic accomplishments. The book is filled with full-page images of Jackson Pollack paintings and store shelves filled with pigments; photos of antique paint tubes and pastel drawings by Edgar Degas; spectacular old city scape photos of the old shop and inside the old lab and photos of the shop today, a place that hasn’t changed much in a century. If you are planning a visit to the Louvre, do find the time to cross the Seine, make the left turn, follow the classic old buildings until you reach number 3 Quai Voltaire. At the least, you will buy a notebook or a sketchbook (Picasso bought lots of them), and perhaps you will be persuaded to buy a set of Sennelier pastels, which are among the finest in the world, or oils or watercolors, or artist’s pads. You can buy some, or even most, of this merchandise in many U.S. art supply stores, but it’s not the same experience. There is magic in the old shop, magic that is so loving transported into book format. Daniel Greene is one of my favorite artists. Click on the picture to explore his spectacular work. It is a joy filled story: the idea of bringing Sennelier products to the U.S., the magic of those pastels in the hands of a great contemporary artist. Daniel Greene is such an artist, and his two-page spread of Manhattan’s Franklin Street subway station is a wonder. So, too, are the simple photos of the neatly-ordered tortillons in a century-0ld drawer in the old shop. For about ten years, I have so enjoyed using Sennelier pastels. The freshness and depth of their color makes every painting special. When I have a Sennelier pastel in my hand, I sense that there is legend there. I visited the shop in Paris, and sensed some of the history, but it was difficult to understand how the story fit together. When I started reading the book, I loved the combination of new and vintage photographs, art and artists at work, and the story told in both French and English blocks of prose. About a third of the way through the book, I realized that I was grinning. And I wondered about the last time I had grinned my way through the reading of an entire book. Several years ago, NPR did a wonderful story about the Sennelier shop. Listen to it here. Even better, I think, is the photo essay and commentary on the blog A Painter in Paris. 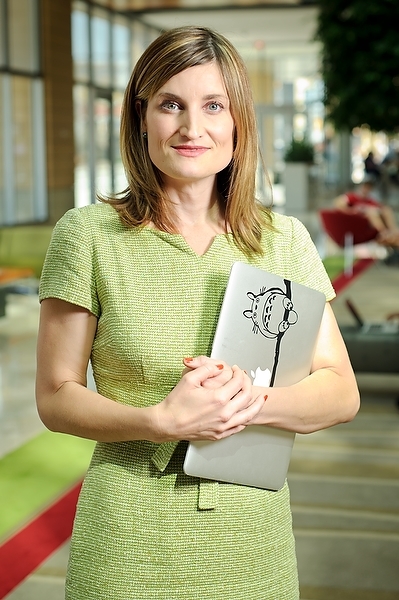 The photo below should encourage you to visit both the blog and the store. Enjoy!